Reuben Palef’s Alta Vista Drive Apartments, 2015. Image: Google Maps. I’ve been on a roll lately when it comes to the cluster apartments developments of the 1950s. Since 1965 is my next stop in the apartment list transcription project, it’s most likely going to be the case that what catches my attention in that year will not be the clusters that defined the 1950s. To that end, much like I have done with Doug O’Connell’s Westwood Park, I’ve decided to select a few of these developments that were completed after 1955. In this case, I’ve looked back eastward, towards Alta Vista’s Riverview Park neighbourhood. Alta Vista Drive Apartments in 1958. Image: geoOttawa. The Riverview Park subdivision was a land assembly project carried out under the Section 46 of the National Housing Act and was completed with the cooperation of federal, provincial, and municipal authorities. Under this approach the federal and provincial governments would purchase tracts of available suburban land, subdivide it and lay roads. The municipal government would provide services to the edge of the property and cover 20% of the local improvements.1Cassie Doyle. Municipal Initiatives in Housing , 1900-1970, City of Ottawa (Ottawa: City of Ottawa Non-Profit Housing Corporation, December 1982): 35-36. Riverview Park as it appeared on the Federal District Commission map in 1954. Source: The National Capital: Ottawa and Environs. Ottawa: Federal District Commission, Information Office, National Capital Planning Committee, 1954. Without going into too much detail (I am working on a longer, more general, story about the neighbourhood itself) Riverview Park was situated on the Grey Sisters’ property known as St. Louis Farm, the 333 acres of which was offered to the city at a cost of $600 per acre ($199,800).2Ibid. ; “City Secures 333 Acres For 1,200 Houses,” Ottawa Journal, July 14, 1950, pp. 1, 14. 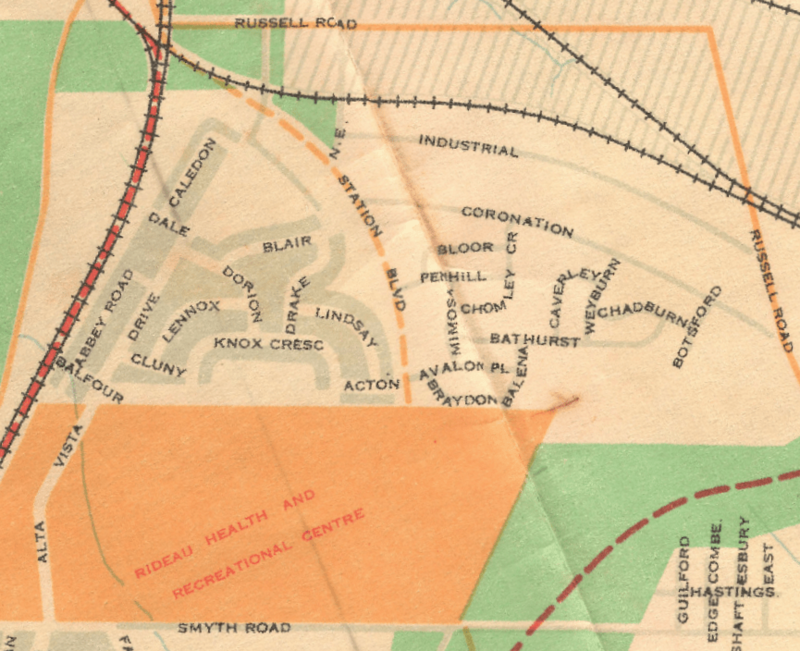 Although the subdivision plan was was not submitted by the Central (Canada) Mortgage and Housing Corporation (CMHC) until November 6, 1951,3Ottawa Land Registry Office, Plan 567, Reel 4AR90. sale of the individual lots commenced September 10, 1951.4”Riverview Building Lots on Sale Monday,” Ottawa Journal, September 7, 1951, p. 18. With a few exceptions, lots were sold at $250 each regardless of size or location, limited to one per buyer, and were sold on a first-come, first-served basis.5Ibid. By December, 98 of 130 were sold.6”CMHC Approves Construction Of 4 West End Rental Blocks,” Ottawa Journal, December 11, 1951, p. 3. Riverview Park was being developed through the 1950s. This was taken nearby at Russell (Tremblay) and Alta Vista. 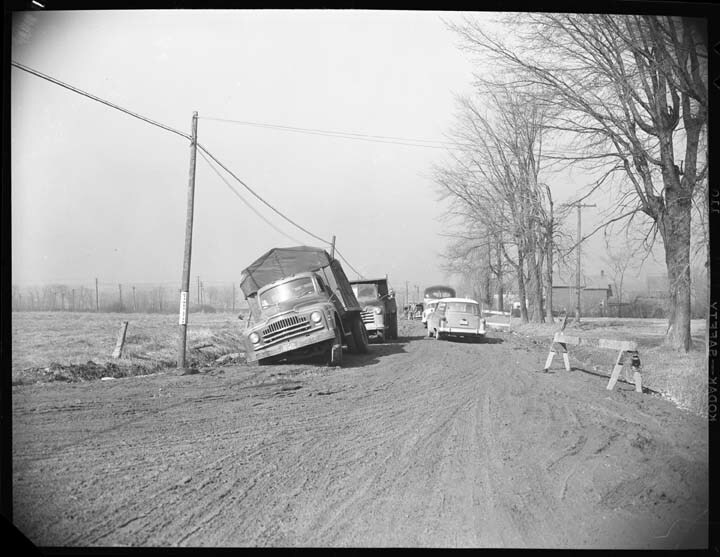 Source: City of Ottawa Archives, April 18, 1955, Item CA032154. For the first three years of sale, Riverview Park was strictly a residential area in which only single family homes were acceptable. In October of 1954, the Ontario Municipal Board granted the City approval to amend the area’s zoning bylaw so that shopping areas, gas stations, and apartments buildings could be added to the mix.7”Riverview Park Zoning Approved,” Ottawa Journal, October 13, 1954, p. 20. It seems to be the case that this was envisioned by the CMHC from the beginning: the subdivision plan set certain parcels aside at busy intersections, including Parcels A and B on either side of Alta Vista and Dorion.8Ottawa Land Registry Office, Plans 566, 567, 569, Reel 4AR90. These parcels, located at potentially valuable sites, were the exception. The one advertisement I have been able to find for the apartments. Source: May 4, 1956, p. 41. 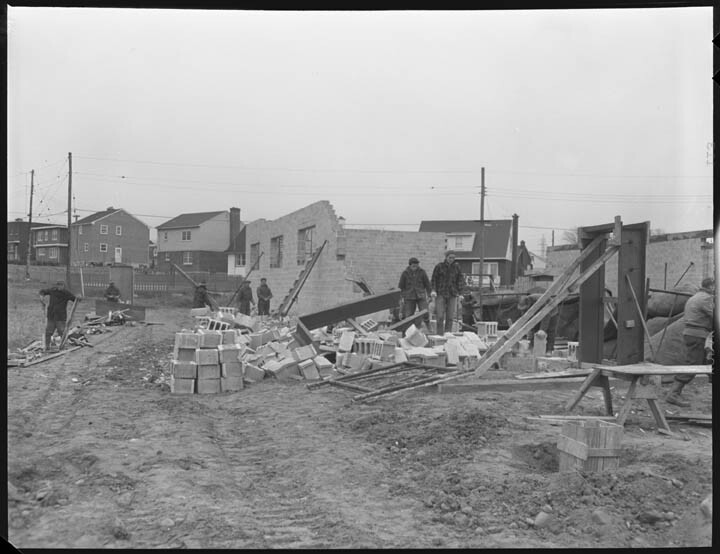 On November 13, 1955, a consortium of bidders, represented by Ottawa Fruit Supply secretary Reuben Palef, purchased Parcel A, which was located on the south east corner of Alta Vista Drive and Dorion Avenue, from the CMHC for $30,200.9Ottawa Land Registry Office, Plan 567, Parcel A, Reel 4AR90. The consortium, named Alva Interests,10Alva Interests was comprised of Reuben Palef, Lawrence Palef, Samuel Palef, Bessie Greenberg, Sybil Greenberg, and Bessie Spiro. 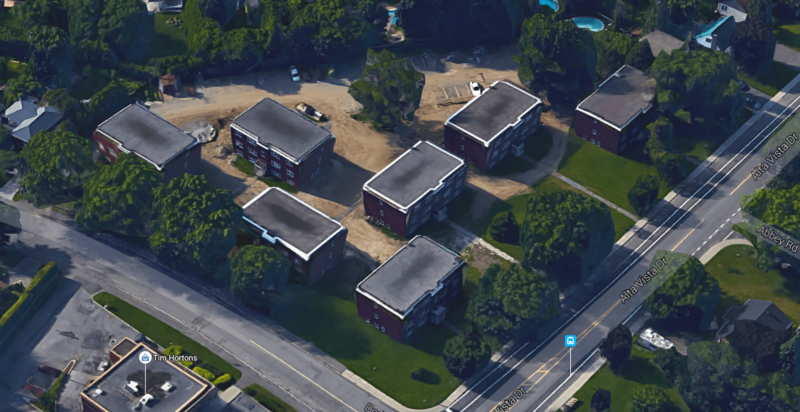 planned to erect seven six-unit buildings on the site at a cost of $400,000. The seven buildings were designed by the architectural firm of Greenspoon, Freedlander, and Dunne and the project was to completed and ready for occupancy on October 1, 1956. Caveward Construction was the contractor.11”Building $400,000 Apartment Block On Alta Vista Drive,” Ottawa Journal, November 25, 1955, p. 9. The cluster, as it appeared in 2015. Image: Google Maps. Palef and his partners at Alva Interests do not appear to have advertised much, if at all, save for one each run in the Citizen and the Journal on November 2 and 4, 1955. It also does not appear to be the case that Palef formally named the seven building cluster. With no advertisements, this is not entirely surprising. It could have been just a matter of his being quite occupied with his development of the Alta Vista Shopping Centre across the road. The Alta Vista Shopping Centre, as introduced to anxious Riverview Park residents. Source: Ottawa Journal, September 20, 1955, p. 16. On June 1, 1955, Reuben and Samuel Palef purchased Parcel B (Plans 566/569) from the Central Mortgage and Housing Corporation for $33,200.12Ottawa Land Registry Office, Plan 569, Parcel B, Reel 4AR90. As the deal was being completed, both the Journal and the Citizen announced the plan. Reuben and Sam Palef shared with the Citizen that they had intended to begin construction as soon as possible on the sixteen-unit shopping centre, to be anchored by a supermarket. The main reason given was for the “complete lack of shopping facilities in the Riverview area.”13”New $500,000 Shop Center Planned For Alta Vista,” Ottawa Citizen, May 27, 1955, p.1; “$500,000 Shopping Centre For Alta Vista,” Ottawa Journal, May 26, 1955, p. 1. “Alta Vista Shopping Centre wall blown out,” November 17, 1955. It appears that there were some difficulties experienced during the mall’s construction. Source: City of Ottawa Archives, Item CA035401. The Alta Vista Shopping Centre’s anchor, the grocery store, was likely Palef’s motivation and pot-sweetener for the development. In the past summer, Palef struck a grocers’ network to compete with the Loeb’s own Foodliner: Allied Food Markets.14”Allied Food Markets Represent Fine Stores,” Ottawa Journal, July 23, 1954, p. 12. By the time construction began on the Alta Vista Shopping Centre, the number of units had been reduced from 16 to 12. Architects for strip mall were Greenspoon, Freedlander, and Dunne.15”Shopping Centre On Alta Vista Soon Under Way,” Ottawa Journal, September 20, 1955, p. 16. For a small sampling of projects that Greenspoon, Freedlander, and Dunne designed in Ottawa during the time, see my previous story about the Governor Metcalfe Apartments. By the time the Alta Vista Shopping Centre was poised to open, Palef had joined the grocery retailing federation of Clover Farm Stores. Source: Ottawa Journal, April 11, 1956, p. 36. As the Alta Vista Shopping Centre was being constructed, Reuben Palef joined a number of other local wholesalers in affiliating with the Clover Farm Stores network of stores (again, much like Loeb’s affiliation with the IGA network). The well-established marketing network of Clover Farm, it was reported, counted more than 3,000 stores across the United States and was established in 1882.16”Ottawa Wholesale Firm Joins New Canadian Food Chain,” Ottawa Journal, October 21, 1955, p. 2. Palef’s Ottawa Fruit Supply, in conjunction with Toronto’s James Lumbers Co. and Sudbury’s J.A. Lapalme and Sons, ushered the American chain into the Canadian market.17”Ottawa Fruit Supply Ltd. Announces New Operation,” Ottawa Journal, October 21, 1955, p. 5. The 35 Clover Farm stores in the Greater Ottawa region opened on March of 1956.18”35 Area Clover Farm Food Markets Open Saturday Morning,” Ottawa Journal, March 16, 1956, p. 44. 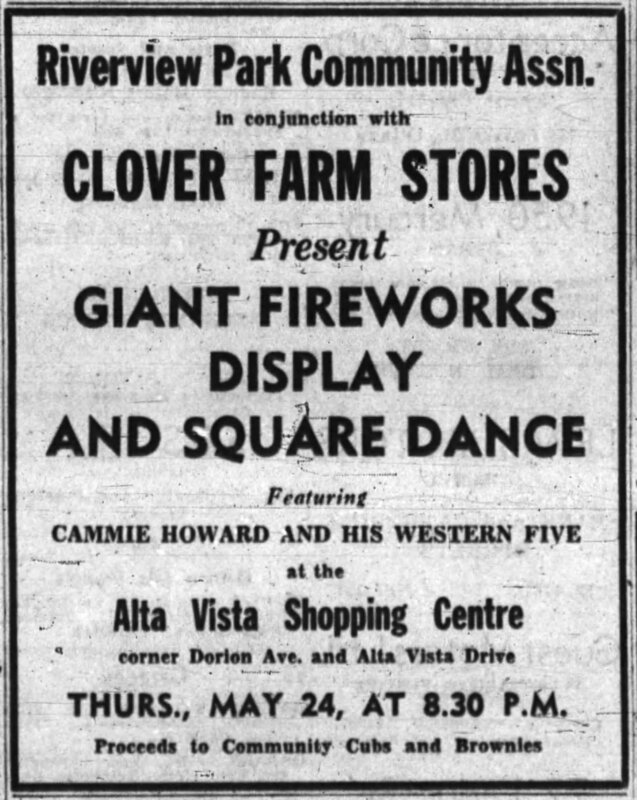 The Alta Vista Shopping Centre’s Clover Farm Store opened on April 12, 1956.19Ottawa Journal, April 11, 1956, pp. 36-37. One month into the shopping centre’s opening, the Riverview Park Community Association and Clover Farm Stores put on a fireworks display. Source: Ottawa Journal, May 22, 1956, p. 38. The Clover Farm Stores initiative in Canada appears to have been quite successful for Palef: by the waning days of the summer of 1956, he announced that Ottawa Fruit Supply would be soon constructing a new $500,000 warehouse nearby on Industrial Avenue. As was the case with so many of Palef’s projects, the warehouse was designed by Greenspoon, Freedlander, and Dunne.20”Ottawa Fruit Supply Ltd. Start $500,000 Expansion,” Ottawa Journal, August 25, 1956, p. 36. The new warehouse opened in November of 1957 and did double duty as the regional headquarters for the Clover Farm Stores located in Eastern Ontario.21Ottawa Journal, November 9, 1957, pp. 36-37. The Imperial Bank of Canada signed one of the first leases signed in the Alta Vista Shopping Centre. Source: Ottawa Journal, April 16, 1956, p. 12. At opening, rents in the Alta Vista Shopping Centre ran from $2,100 per year for a small unit, all the way up to $10,300 per year for the Clover Farm Store.22Ottawa Land Registry Office, Plan 569, Parcel B, Reel 4AR90. For more context surrounding Reuben Palef and Greenspoon, Freedlander, and Dunne, see Robert Smythe’s article “The Doctors’ Building“. 1. ↥ Cassie Doyle. Municipal Initiatives in Housing , 1900-1970, City of Ottawa (Ottawa: City of Ottawa Non-Profit Housing Corporation, December 1982): 35-36. 2. ↥ Ibid. ; “City Secures 333 Acres For 1,200 Houses,” Ottawa Journal, July 14, 1950, pp. 1, 14. 3. ↥ Ottawa Land Registry Office, Plan 567, Reel 4AR90. 4. ↥ ”Riverview Building Lots on Sale Monday,” Ottawa Journal, September 7, 1951, p. 18. 6. ↥ ”CMHC Approves Construction Of 4 West End Rental Blocks,” Ottawa Journal, December 11, 1951, p. 3. 7. ↥ ”Riverview Park Zoning Approved,” Ottawa Journal, October 13, 1954, p. 20. 8. 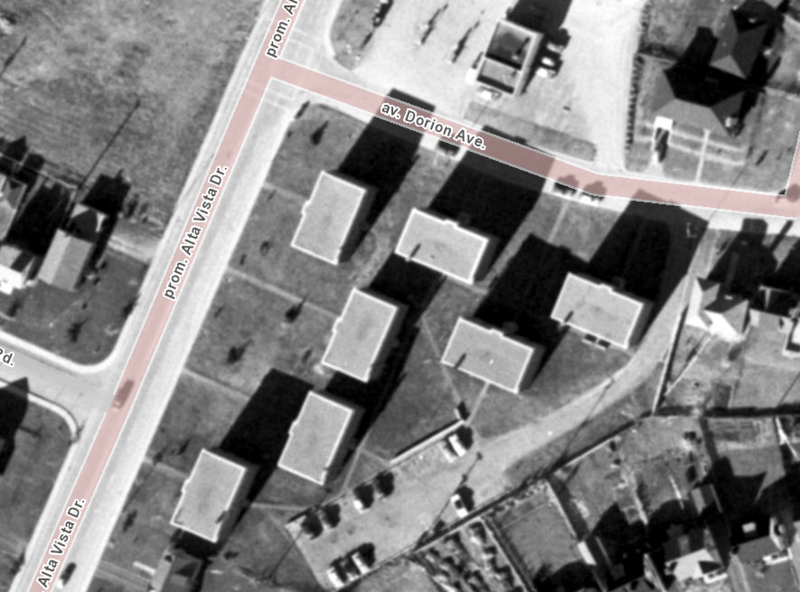 ↥ Ottawa Land Registry Office, Plans 566, 567, 569, Reel 4AR90. 9. ↥ Ottawa Land Registry Office, Plan 567, Parcel A, Reel 4AR90. 10. ↥ Alva Interests was comprised of Reuben Palef, Lawrence Palef, Samuel Palef, Bessie Greenberg, Sybil Greenberg, and Bessie Spiro. 11. 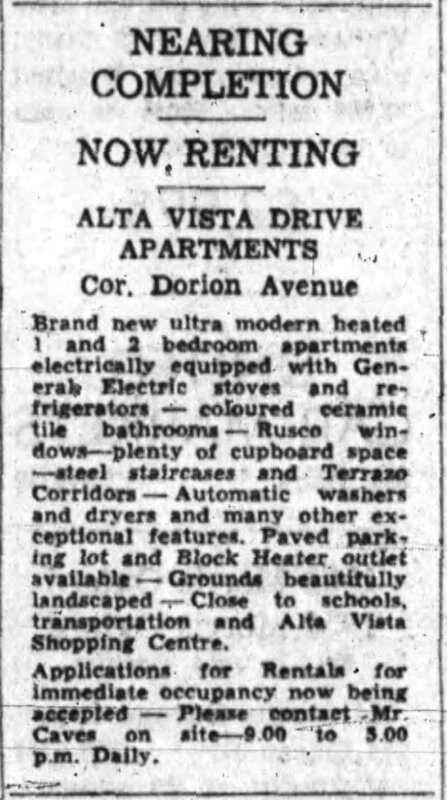 ↥ ”Building $400,000 Apartment Block On Alta Vista Drive,” Ottawa Journal, November 25, 1955, p. 9. 12. ↥ Ottawa Land Registry Office, Plan 569, Parcel B, Reel 4AR90. 13. 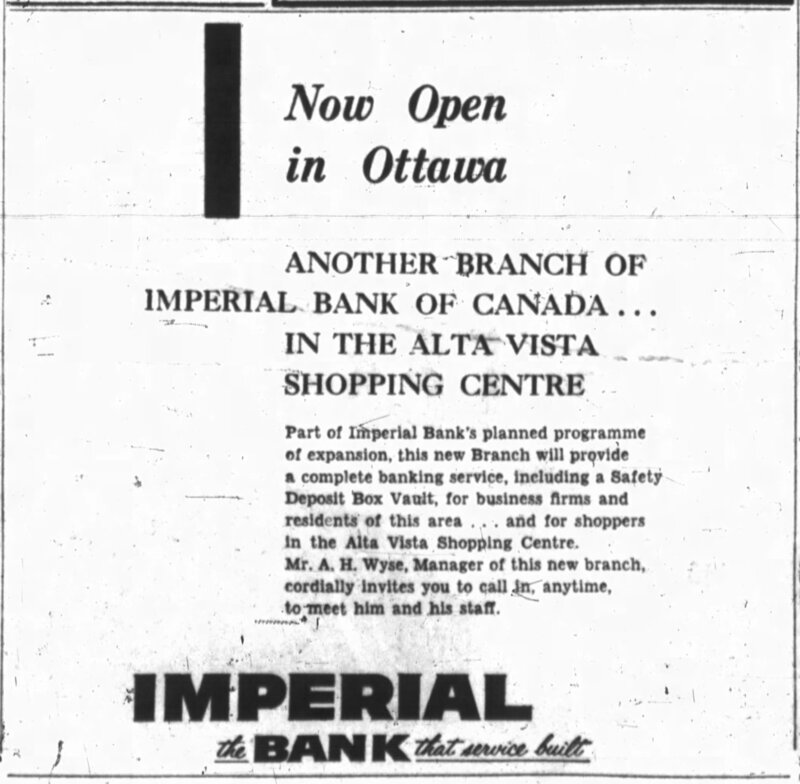 ↥ ”New $500,000 Shop Center Planned For Alta Vista,” Ottawa Citizen, May 27, 1955, p.1; “$500,000 Shopping Centre For Alta Vista,” Ottawa Journal, May 26, 1955, p. 1. 14. ↥ ”Allied Food Markets Represent Fine Stores,” Ottawa Journal, July 23, 1954, p. 12. 15. 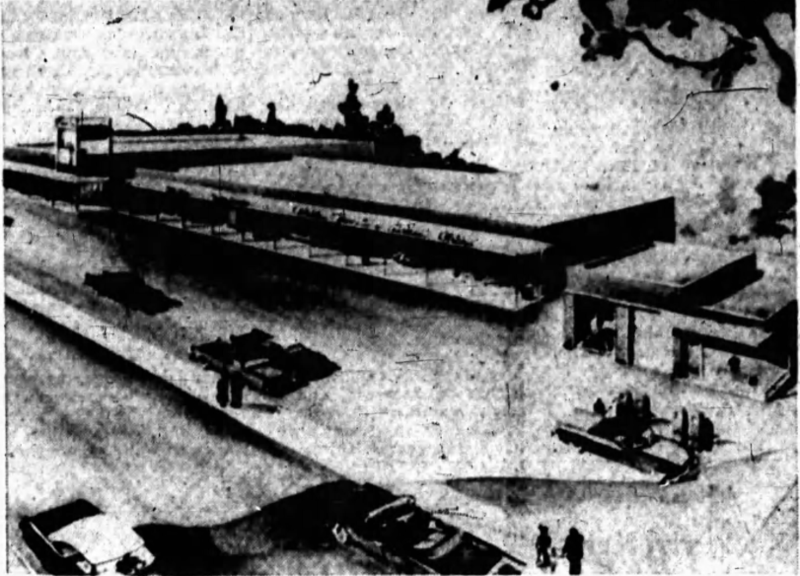 ↥ ”Shopping Centre On Alta Vista Soon Under Way,” Ottawa Journal, September 20, 1955, p. 16. For a small sampling of projects that Greenspoon, Freedlander, and Dunne designed in Ottawa during the time, see my previous story about the Governor Metcalfe Apartments. 16. ↥ ”Ottawa Wholesale Firm Joins New Canadian Food Chain,” Ottawa Journal, October 21, 1955, p. 2. 17. ↥ ”Ottawa Fruit Supply Ltd. Announces New Operation,” Ottawa Journal, October 21, 1955, p. 5. 18. 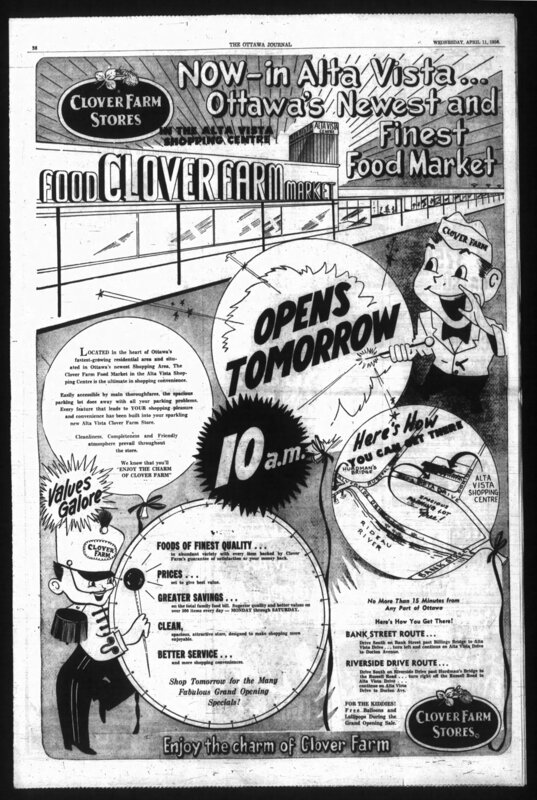 ↥ ”35 Area Clover Farm Food Markets Open Saturday Morning,” Ottawa Journal, March 16, 1956, p. 44. 19. ↥ Ottawa Journal, April 11, 1956, pp. 36-37. 20. ↥ ”Ottawa Fruit Supply Ltd. Start $500,000 Expansion,” Ottawa Journal, August 25, 1956, p. 36. 21. ↥ Ottawa Journal, November 9, 1957, pp. 36-37. 22. ↥ Ottawa Land Registry Office, Plan 569, Parcel B, Reel 4AR90. Thanks so much! I’ll definitely share it out once I have it written. Most interesting. We moved to Riverview Park in 1976 and am eager to know more of the growth of the neighbourhood. Hi Chris, Will give you credit for some of my comments and illustrations in an article “The Alta Vista Shopping Centre” in the upcoming Riverview Park Review.